Four years ago, the head of Harker’s high school division Samuel Keller implemented a policy exempting seniors from first semester final exams. Instead of a finals week, seniors had a week dedicated to college applications. This change came with a much-debated decision to move exams to before winter break, an alteration that was designed to remove stress from student lives. As Gunn has recently moved exams to before break, it only follows that a new policy on senior finals should also be put into place. Gunn seniors deserve similarly privileged treatment in order to give them more time for college applications, avoid unnecessary work and improve student, parent and teacher morale. The majority of Gunn students’ ultimate goals after high school lie in getting admitted to college. At Harker, rather than waste their seniors’ time with finals, they schedule appointments for students with their college counselor. According to Keller, seniors have shown great improvement in the thoroughness of college applications due to the additional college counseling and he lowered stress levels. In such a high-achieving school like Gunn, such a policy to help with college admissions would be greatly welcomed by students, teachers and parents alike. Students are the obvious beneficiary of the lack of finals, not only academically but socially as well. The extra week of waking up later and a self-set schedule for college applications vastly improves students’ morale at the end of the semester, and when seniors are happier, they are more emotionally stable. At Gunn, where students’ emotional health is constantly scrutinized, a policy such as Harker’s would assuage concerns of worried critics by improving seniors’ quality of life and time management when it comes to dealing with college. Teachers also stand to benefit from such a policy. The normal drill for a teacher during finals involves writing, administering and grading tests, which creates hours of extra work. Exempting the teachers whose classes consist mainly or completely of seniors allows them to spend more time advising students on their college essays and otherwise guiding students through college applications and other academic matters. This allows students to receive even more guidance through adults they already work with. 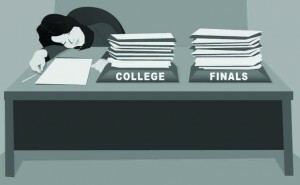 The third beneficiary of a college preparation week are the parents. According to Keller, Harker’s parents gave resounding support when Keller’s idea was proposed, and they have since continued without complaint. Implementing a policy of senior exemption from finals addresses common concerns raised at the school board meetings that discussed the calendar change to pre-break finals. 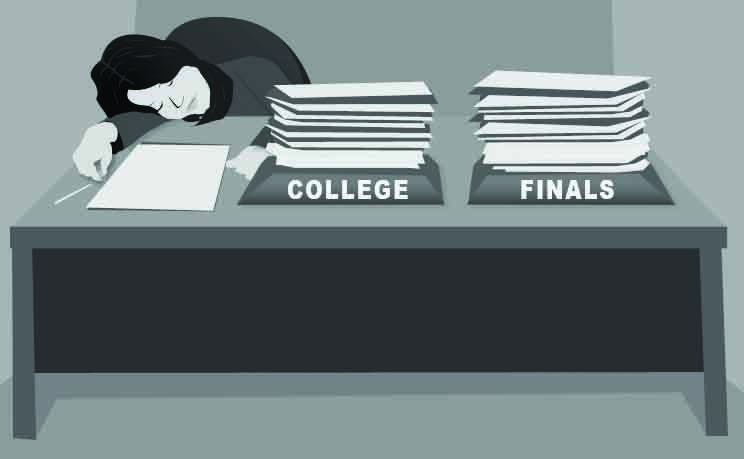 From a parent’s perspective, he or she greatly prefers seniors to be finishing college applications instead of studying for finals. For the vast majority of seniors, their final grades will not have a large impact on their grade point averages. As for the few borderline students whose grade will be decided by a final, it seems more logical to go by their semester-long performance rather than a one-day hit or miss test. Senior finals are a waste of work and time for teachers and students alike, and they only increase already hefty workloads. Gunn needs to give its seniors a break in their last year of high school and let them focus on what really matters.